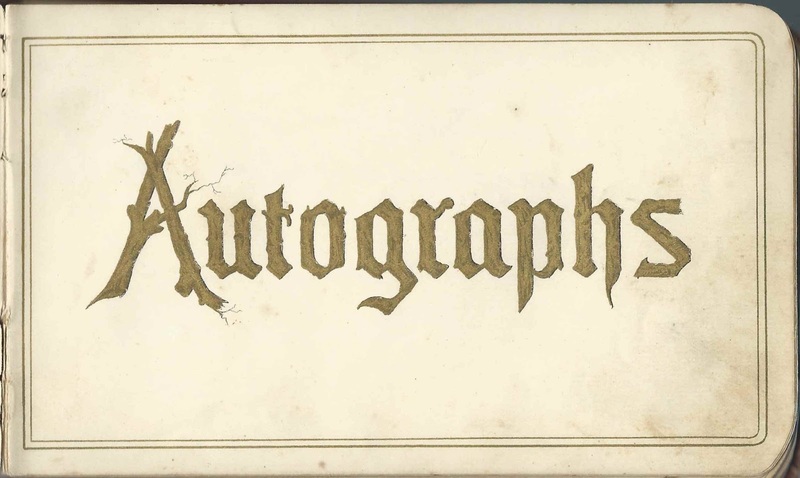 Autograph album kept through the 1880s and 1890s by Edith E. Hoffman of St. Clair County, Michigan. The inside front cover shows that Edith was given the album in 1884 by Lizzie Moore, presumably Edith teacher or Sunday School teacher. The album measures approximately 7" by 4-1/4" and contains the sentiments of over 80 of Edith's relatives, friends, schoolmates and teachers. An alphabetical list of the inscribers, together with any personal information they offered, appears at the end of this post. Edith E. Hoffman was born July 10, 1874, either at Burtchville, Michigan, according to her marriage record, or Niagara, New York, according to her death record. It would seem that the marriage record would be more credible. Edith was the daughter of Luther Newton Hoffman and Mary Effie (Duncan) Hoffman, both New York natives. 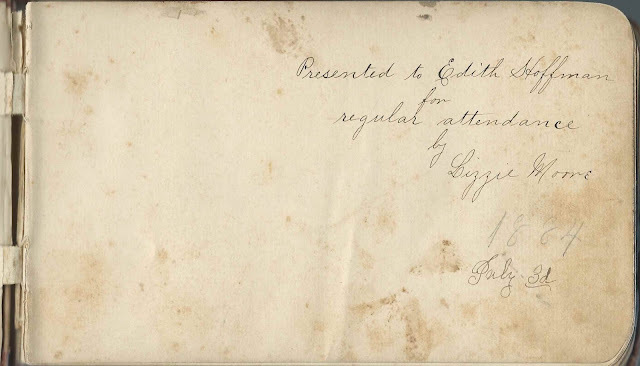 Luther Newton Hoffman inscribed a page in his daughter's album on January 10, 1886, as "Your Father". 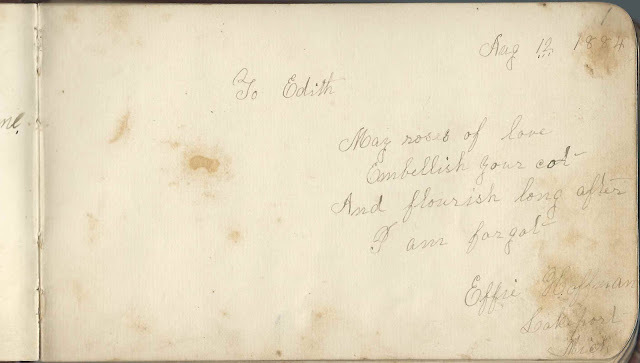 The Effie Hoffman who inscribed a page at Lakeport, Michigan, on August 12, 1884 may have been Edith's mother Mary Effie (Duncan) Hoffman. Ida; inscribed on November 2, 1894. Edith's cousin. Perhaps Ida C. Lamb, daughter of Isaac Mathias Lamb and Annette (Hoffman) Lamb, who was a sister to Edith's father Luther Newton Hoffman. Uncle Will; possibly William H. Duncan, who was a brother to Edith's mother Mary Effie (Duncan) Hoffman. 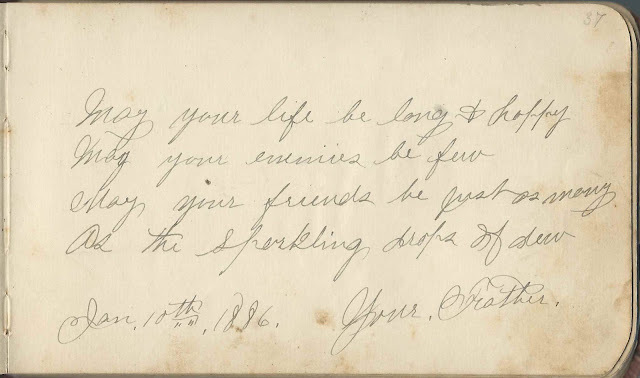 Jessie of Blaine, Michigan; inscribed on July 5, 1886. Edith's cousin. Perhaps Jessie Estella Hamlin, daughter of Frank Andrew Hamlin and Ida Mariah (Hoffman) Hamlin, who was a sister to Edith's father Luther Newton Hoffman. Lester D. Cole of Jeddo, Michigan; inscribed on March 17, 1893. Edith's cousin, who was the son of Isaac Cole and Emma (Duncan) Cole, who was a sister to Edith's mother Mary Effie (Duncan) Hoffman. 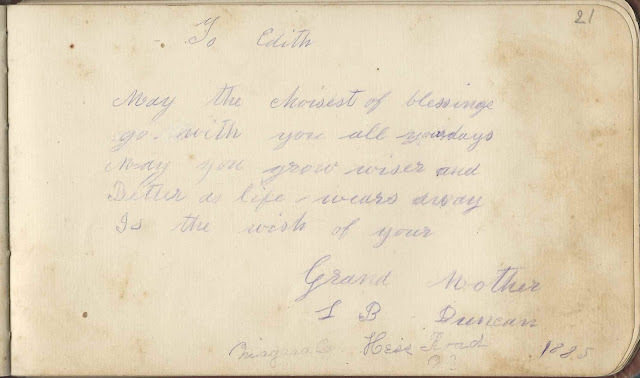 G. M. Duncan, "your Uncle"; of Hess Road, New York; inscribed on November 5, 1893. Gilbert Mooney Duncan, who was a brother to Edith's mother Mary Effie (Duncan) Hoffman. Shared the page with his wife Mary Ann (Root) Duncan. H. C. Duncan; inscribed on November 5, 1885. "From Grandpa". Hiram C. Duncan, father of Edith's mother Mary Effie (Duncan) Hoffman. 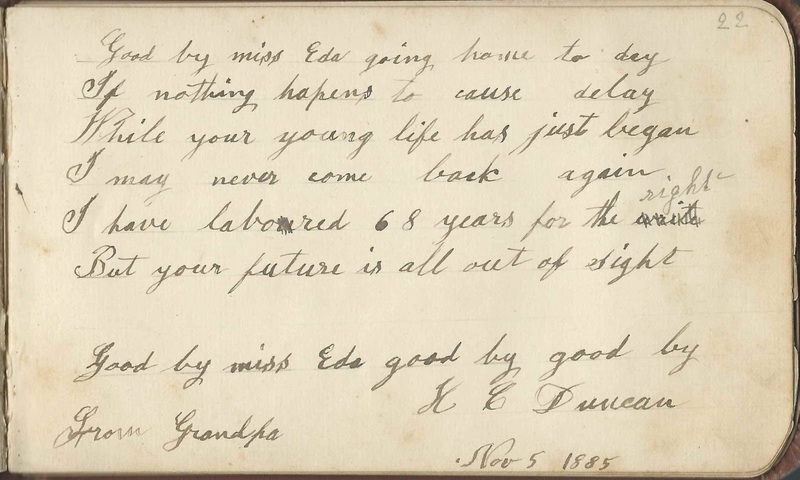 "...I have labored 68 years..."
L. B. Duncan of Hess Road, New York, in the town of Newfane in Niagara County; inscribed in 1885. "Grand Mother L. B. Duncan". 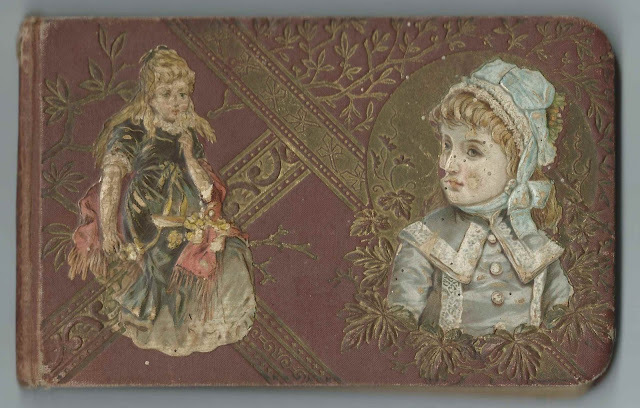 She was [Lucilla or Lucretia] Belinda (Ferguson) Duncan, mother of Edith's mother Mary Effie (Duncan) Hoffman. Mary R. Duncan of Hess Road, New York; inscribed on November 5, 1893. She was Mary Ann (Root) Duncan, wife of Gilbert Mooney Duncan, with whom she shared the page. Andrew Hamlin of Port Huron, Michigan; inscribed on October 7, 1891. Edith's cousin Andrew James Hamlin, son of inscriber Frank Andrew Hamlin and Ida Mariah (Hoffman) Hamlin, who was a sister to Edith's father Luther Newton Hoffman. 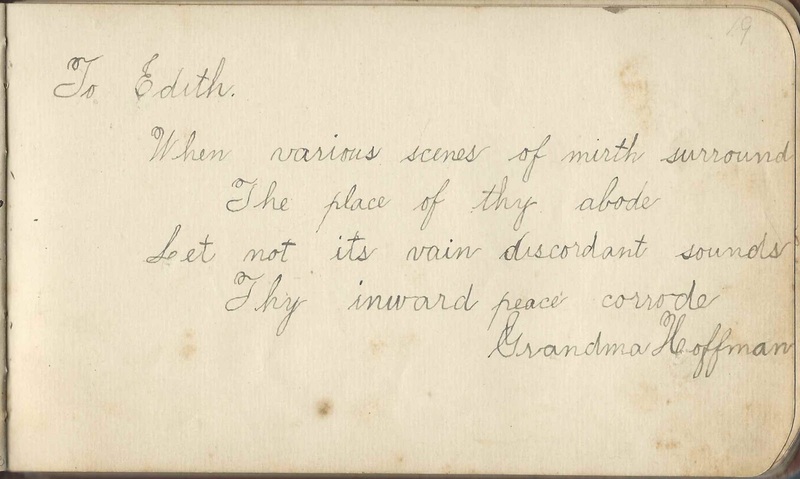 Edith Hamlin; inscribed at Port Huron, Michigan, on August 31, 1894. Edith's cousin Edith Amy Hamlin, daughter of Frank Andrew Hamlin and Ida Mariah (Hoffman) Hamlin, who was a sister to Edith Hoffman's father Luther Newton Hoffman. Seward A. Lamb of Springport, Michigan; inscribed on March 3, 1903. Edith's cousin. Son of Isaac Mathias Lamb and Annette (Hoffman) Lamb, who was a sister to Edith's father Luther Newton Hoffman. Kittie Mead of Saginaw City, Michigan; inscribed at Lakeport, Michigan, on September 12, 1886. Edith's cousin. Possibly Kittie Clara Mead, daughter of George F. Mead and Orpha Marilla (Stark) Mead. Presumably related to Edith through their shared Ferguson ancestors. On December 26, 1907 at Lansing, Michigan, Edith E. Hoffman married George N. McLaughlin, son of James McLaughlin and Jenette (Reed) McLaughlin. Edith and George lived at Almont, Michigan, where George farmed and Edith taught school. George died in 1942 and Edith in 1944. They're buried in the West Berlin Cemetery at Allenton, Michgan. Maggie Austin; inscribed at Jeddo, Michigan, on March 5, 1889. Her initials, written along the side, are M.M.A. C. Decker; middle initial possibly Y or Z or ? 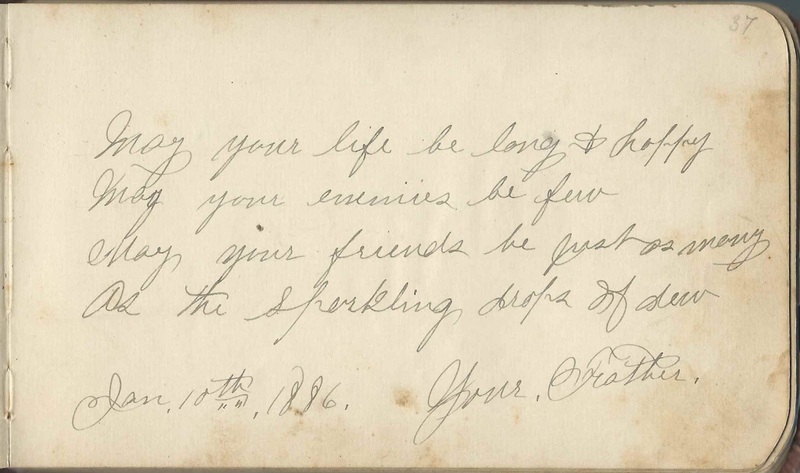 Inscribed at Croswell, Michigan, on February 27, 1886. If the middle initial is Y, the inscriber may have been Chauncey Youngs Decker. Rev. W. C. Harger of Jeddo, Michigan; inscribed on March 29, 1895. Presumably Rev. Willis C. Harger. Luther Newton Hoffman; inscribed on January 10, 1886. The inscription reads only "Your Father". Edith's father. Mrs. A. Huie, or Mrs. A. Hine, of Port Huron, Michigan; inscribed in 1885. If Mrs. A. Huie, she may have been Mrs. Amarancy (Woodard or Woodward) Huie, mother of Henry B. Huie. Lizzie Moore; presumably a school teacher or Sunday School teacher, who gave the album on July 3, 1884 to Edith Hoffman for Edith's "regular attendance"
A. S. M.; along the right edge "Aaron Moyer"
Anna Gusta Worden; inscribed on July 4, 1892. Was she Anna Augusta Worden, who married Daniel Toffey Worden?